These parents are SICK. Who would mutilate a person in such a way ? Its not the childs fault that you can't take care of them and it cert does not give the right to mess with thier body in such a way. Whats next kill all people with cancer that cant be cured so they wont feal pain ? Geez I am soo disgusted by these peoples actions. I can understand why these parents did what they did. My son is only 2 and a half and he is having more and more trouble being comfortable and doing therapies. He has quad cerebral palsy and microcephaly, with the motor and cognitive abilities of a 4 month old. Their daughter sounds even more disabled than my son. Ashley is not going to have a normal life, no matter what strangers may think. She does not have a mild case of cp! This allows her to remain with her family, and don't give me that mess about "community services." Why would I trust someone making minimum wage to adequately care for my child? The people who are going to do the best for my child are my husband and I. 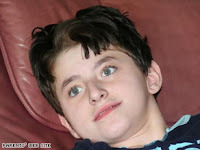 There is no way in heck I would EVER put my son in a group home!!! Do you know what goes on there???!! You people who are so judgmental of these parents can go around spouting off about the rights of Ashley, but you are not looking at REALITY. Ashley is not going to be a "full woman" like someone said because, did you not hear, she functions at the level of a 6 month old!! This is not going to change! She is not going to catch up - at best she'll progress to the level of a young child. This way she can be comfortable and loved by people who love her, not people who are paid next to nothing to change her diaper once a day. GIVE ME A BREAK!! What they did they did out of love and concern for their daughter. Why don't you go out and get upset about children who are really being abused? They are everywhere, and no one is doing anything about that. "It's not the child's fault that you can't take care of them" so what do you suggest?? You judgemental idiots make me sick. Sorry for getting angry but unless you have a child with such severe disabilities, I don't want to hear a word out of you about this, because you know NOTHING about it.